Boat windshield made of 1/4" premium un breakable lexan. (Thicker and more durable than the competition). 10 1/2" High by 20" outside dimensions wide with 6" side flankers. Mounts on top of a flat console. Clips preinstalled. Shield will fit any console at least 20" wide and flat on top. COLOR IS OFF-WHITE! THESE FIT INTO YOUR COLLECTOR BOX WHICH IS 12-1/4" BY 3-3/4" MAXIMUM. THE BACK OF THIS VENT IS 12" BY 3-1/2". HAPPY BOATING! SEARAYMAN13 NOTE! THESE ARE PLASTIC AND HAVE BEEN MADE OF PLASTIC SINCE FIRST MADE IN 1980'S! BLACK WINDSHIELD RUBBER INSERT SCREW COVER(GASKET). 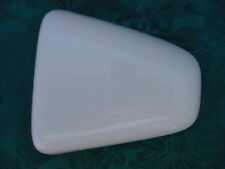 FOR FORMULA, SEA RAY, BAYLINER AND OTHER BOATS,, AND ALSO FOR MANY OTHER BOATS USING TAYLOR WINDSHIELDS. THIS RUBBER INSERT IS MADE TO COVER THE SCREWS WHERE YOU WINDSHIELD IS MOUNTED TO THE DECK. UNIVERSAL FIT SMOKED PLEXIGLASS BOAT WINDSHIELD CENTER OR SIDE CONSOLE 22"
It is designed to fit any small or mid-size center or side console boat as long as the top of the console is flat. Will also work on other types of boats as long as there is a flat surface to mount it to. 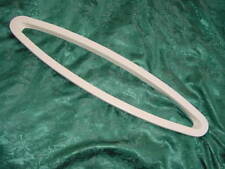 "GENUINE" SEA RAY SEARAY PORTHOLE BOW WINDOW OUTER RING>>1980'S ERA TO PRESENT SEA RAY MODELS. SEE ALL PICTURES ABOVE. GENUINE AND EXACT FIT! HAPPY BOATING! Ask the competition why theirs does not have the locks on the back of their rings! SEA RAY GENUINE! YOU GET TWO ! 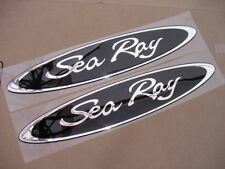 UP FOR YOUR CONSIDERATION ARE TWO 13" SEA RAY EMBLEMS. SOLD IN PAIRS, YES,, YOU GET TWOOF THESE. SEE all PICTURES! PEEL AND STICK BACKING. ACTUAL SIZE IS 13-1/8" BY 2-3/4" IN THE MIDDLE. HEIGHT IS 5" AND THE WIDTH IS 5-5/8" EZ APPLICATION WITH PEEL AND STICK BACKING. HAPPY BOATING! GENUINE,, EXACT! NEED LETTERS TOO??. WE HAVE BOTH SIZES. ( 2-1/4" FOR 1997 AND NEWER AND 2-5/8" HIGH LETTERS usually FOR 1996 AND EARLIER YEARS! ). One new FORMULA BOAT ROUND steering wheel emblem. Made for steering wheel center cap,, ,, or even great for your car, truck or to cover an unsightly hole in dash. Size: 1-11/16" across,, peel and stick backing for any flat surface. NEW – ORIGINAL SEARAY EMBLEM. White Grab Handle. Light weight and strong! Perfect for the interior or exterior on boats and RV. Easy to install in minutes. Poly vinyl amber rollers are long lasting, will absorb shock, are cut resistant and will not mark or mar your boat. Boat windshield made of 1/4" premium un breakable lexan. (Thicker and more durable than the competition). 10 1/2" High by 24" outside dimensions wide with 6" side flankers. Mounts on top of a flat console. Clips preinstalled. Shield will fit any console at least 24" wide and flat on top. VENT WINDOW BOAT MARINE "D" HANDLES FOR SEA RAY BAYLINER AND MANY MANY OTHER BOATS WITH SIDE VENT OPENING WINDOWS! SOLD IN PAIRS. THESE HANDLES TURN TO LOCK YOUR SIDE VENT WINDOW CLOSED. THESE ARE MADE OF PLASTIC AND ARE NEW, UNUSED. SEE ALL THE PICTURES. THE SCREEN ALONE IS. 14-7/8 long 4-3/4" high. NEED MORE?. just enter the quantity u need above! HAPPY BOATING! just as described. 8' Long per piece, 2 3/4" on the top, 3 1/4" down the side. L channel goes around the pontoon boat deck to hide the wood and risers on pontoon boats. Sold per 8' piece, minimum order of 6. If you have a 24' pontoon boat you will need 8 pieces, 3 per side, 1 in the front, and 1 in the Stern (rear). These will produce lift that gets your pontoon on plane faster and stay on plane with less effort. This intern saves on fuel and adds a little speed and performance to your boat. Enhances rough water performance as well. Boat part number 8201342 is a new pair of windshield arm support brace brackets from NTI, part number 01619. Part Number: 01619. Part Manufacturer: NTI. We're your port for thousands of hard to find boat parts, original manufacturer's parts and marine surplus. (These StarCraft Emblems are made of brushed stainless steel. They will not rust, chip or break. "one of each" #2 and #3). We have added this page to our website as there is a growing demand through the forums of boat restorations. Exotic Wood Premium Marine Teak Lumber 1" X 16" X 1/2"
Teak forests are highly regulated due to the increased demand, ecological and economical impact, and often sub-standard working conditions on plantations. It is not a rain forest species; growing in deciduous forests at a yield of only 3-5 trees per acre. Exotic Wood Premium Marine Teak Lumber 2" X 13" X 3/4"
For those of you who have never worked with marine teak. This is the only wood that will change color. When exposed to direct sunlight, it will change from green to orange, to brown which is the final color. HARD TO FIND IN WHITE! You get them both! BAYLINER, SEARAY AND MANY OTHER MAKE BOATS TOO! THESE ARE "WHITE" VENTS. FOR THOSE WHO WANT A CLOSER MATCH TO THEIR WHITE HULL! THESE ARE 17 7/8" LONG BY 3 1/2" WIDE. GREY SIDE HULL VENT LOUVER 14" BOAT NEW 14-1/8" X 5-5/8". RARE FIND! Enter how many pair you need above. NEVER USED. COLOR IS "GREY". THESE FIT INTO YOUR COLLECTOR BOX WHICH IS 12-1/4" BY 3-3/4" MAXIMUM. One new BOSTON WHALER EMBLEM, OVAL with peel and stick backing. Happy Boating! Often used on the Boston Whaler seat back area or any clean flat surface! 110 % rock solid!! Boat Manufacturer: Alumacraft. This windshield is constructed from clear tinted plexiglass. There are (2) 1/2" W x 1/4" H slotted mounting holes across the bottom. Material: Plexiglass. We're your port for thousands of hard to find boat parts, original manufacturer's parts and marine surplus. JUST NEED ONE OR A FEW??. HAPPY BOATING! Over 100,000,000 served. FREE scheduling, supersized images. SEE PICS, THESE ARE WHITE WHITE. We have more than one available. Just enter how many you need in the QUANTITY box above. CUT OUT IS 12" BY 3 1/2". FOR LATE 1980S THRU 1990 SEA RAY BOATS. Also fit Baja and Silverton boats. BOAT VENT WINDOW SIDE VENT ADJUSTERS SEA RAY WELLCRAFT BAYLINER FORMULA AND MANY OTHERS TOO. SEE ALL THE PICTURES AND SEE FOR YOURSELF! YOU GET THEM BOTH. PORT AND STARBOARD SIDES! SEE ALL PICTURES ABOVE TO COMPARE. Fit my 1990 Glastron Sierra 17ft perfect! NOW SOLD IN PAIRS! Happy Boating! YOUR GET TWO! CUT OUT OPENING (BACK) IS 15-1/2 BY 2". 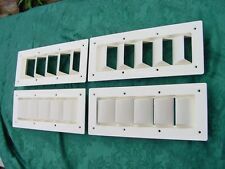 NOTE, WE ALSO CARRY A VERY SIMILIAR VENT TO THESE BUT ARE SLIGHTLY SHORTER (17-1/4" long). It is designed to mount to the top of any small or mid-size center or side console boat as long as the top of the console is flat. Will also work on other types of boats as long as there is a flat surface to mount it to. 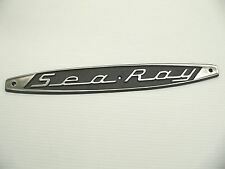 SEA RAY SEARAY SCRIPT CHROME EMBLEM BADGE BOAT LOGO 12-3/4" NEW HAPPY BOATING!! "SEA RAY" GENUINE! LOOK REAL CLOSE! See the difference in each picture! TheseTOP OF THE LETTERS are NOT FLAT!! And note the thickness, especially between the SEA AND RAY words. WITH PEEL AND STICK 3M BACKING. WITH PEEL AND STICK BACKING. EMBLEM IS 1/4" THICK IN THE CENTER. Enter how many you need in the quantity box. MADE IN USA! HAPPY BOATING! GENUINE AND YES! I'll be back when my Sea Ray needs more original spare parts! These are genuine SEA RAY! These are not only great on your boat, but also your car or truck, boat trailer, hitch cover?. Note, we have these in white too if u prefer White. Or feel free to ask us! THESE ARE "NEW",, NEVER USED! ,, ORIGINAL AND BIG! Just enter how many u need at checkout. 24-3/4" LONG AND 5-3/8" WIDE. Cast from an original StarCraft set using impact resistant polyurethane plastic filled with aluminum and milled fiberglass (40% solids). 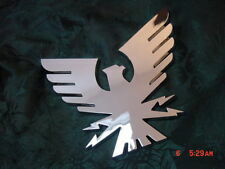 These can be sanded with 200 grit or finer to achieve a brushed aluminum finish. Boat part number 1004528 is a NEW Plexiglass boat windshield originally made for a Godfrey Pontoon Boat (sorry we dont know which model). These are NEW/never installed windshields but MAY have a very slight scratch from handling. GENUINE,, EXACT! NEED LETTERS TOO??. WE HAVE BOTH SIZES. ( 2-1/4" FOR 1997 AND NEWER AND 2-5/8" HIGH LETTERS FOR 1996 AND EARLIER YEARS! HAPPY BOATING! HEIGHT IS 6" AND THE WIDTH IS 6-1/2" EZ APPLICATION WITH PEEL AND STICK BACKING. ). New 487 LH windshield with mounting hardware tinted. NEW Longchamp Le Pliage tote bag. solve anything. We are always willing to work things out and serve! This kit is for a 22' Bi-Toon it is for putting strakes on one side of both toons, either put them on the inside or on the outside. Kit includes 4-8' sections of strakes, 2-2' sections of strakes and 2 cap kits. Strakes and caps are made of .090 thick 3003 aluminium. Stakes have 4" flats with 5/8" legs where they meet the toons. 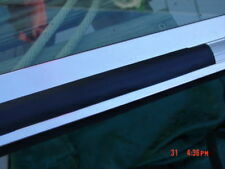 GRADY WHITE, SEA RAY, OTHERS STAINLESS STEEL WINDSHIELD WIPER. 16" IN LENGTH. SEE ALL THE PICTURES. ( SEE THE LAST PICTURE, FOR EXAMPLE PURPOSES ONLY AS TO HOW THIS WIPER ATTACHES TO THE WIPER ARM. ). THESE ARE REAL! THESE ARE GENUINE! 17" LONG BY 3 1/8" WIDE. THESE ARE VERY VERY SLIGHTLY OFF WHITE IN COLOR AND ARE MADE OF PLASTIC. (see pics above) GET YOUR BOAT LOOKING LIKE NEW AGAIN ! >>>>>>>>>>>>>>>>>>>>>> Note,, see all the pictures. 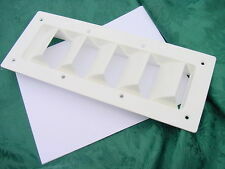 Boat part number 1072824 is a new pair of bimini top mounting brackets; manufactured and part number are unavailable. We're your port for thousands of hard to find boat parts, original manufacturer's parts and marine surplus. HAPPY BOATING! THE FILLER RUBBER HIDES SCREWS! REPLACES THE OLD FOAM TYPE(see the bottom pic) THAT SO OFTEN DRIES UP AND CANT BE USED. SEE ALL THE PICTURES AND HOW THIS NEW RUBBER EASILY INSTALLS. This rub rail is constructed from black vinyl with a black insert. (1) Rub Rail. (1) Rub Rail Insert. We're your port for thousands of hard to find boat parts, original manufacturer's parts and marine surplus. Boat part number 1074599 is a new ski tow pylon from Godfrey Pontoon Boats, part number 201695. May be used on other Pontoon Boats. Part Number: 201695. This ski tow is constructed of stainless steel with a polished finish. 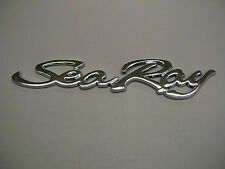 NEW – ORIGINAL SEARAY EMBLEM. SEARAY OEM PART. SEARAY PART# 615880. Fits at the end of the boats rub rail in transom area. See all the pictures. Aprox length is 3-3/4" and 1-7/8" wide where covers the rubrail end. Yes Christmas tree studs are included! SEA RAY BOAT WINDOW SCREEN WITH RUBBER RING HOLDER 14-7/8 long 4-5/8" high NEW ! Boats come in a wide range of sizes made to float, travel, and work on water. Their wide variety of sizes, construction methods, and shapes are dependent on the intended purpose of that vessel. Each boat body part and accessory has a special role to play to ensure that the vessel stays afloat and that those on board are safe. What are the different boat parts? Bow: This is the anterior portion of the hull. As the vessel moves forward this is the part that is visible from the front. Cabin: This is the part that is underneath the deck where one can spend time and sleep. It can be one single room or an entire space of multiple rooms. Deck: This portion sits above the hull. It serves as a roof to the hull and is the place where a lot of navigation work takes place. Fenders: Normally made of rubber or plastic, it bars the boat from crashing onto a pier. This prevents any damage on the pier and the boat in places where they might come into contact. Hatch: This part connects the deck and the bottom of the boat. Depending on the design and the purpose of the boat, they can have single or multiple hatches. Helm: This is a significant part of the vessel as it allows one to steer the boat when navigating along in the water. It is more like a wheel that controls the direction of the vessel. Keel: It is the central beam running from the back (stern) to the front (bow) and passes through the center of the vessel. It is considered the foundation of the boat, and it's typically hidden from view. What are the different hull shapes? The hull is a part of the boat usually considered as its body. When it comes to hull shapes, the main term to consider is the deadrise, which is simply the angle on either side of the boat that makes an imaginary horizontal line. Flat-bottom hulls: This has no deadrise or has just a few degrees. They are popular among hot performance boats that speedily skim across the smooth waters of rivers and lakes. Also, the majority of tournament waterski boats have this design as it creates a smooth wake during skiing. Deep V Hulls: This is wedge-shaped from the stern to the bow. It provides a smooth ride in rough waters. This design is popular among offshore sports boats since the hull knifes cut through the waves as opposed to pounding on it. Modified V: Also called a warped plane. It is common among small boats as it combines the desirable features of the other shapes. It has flatter sections near the stern thus adding stability and increasing the speed, like the flat-bottomed hull. What should you look for in boat parts? Whether you're purchasing an individual part or a complete kit for your boat, it's important to check the compatibility of the part(s). For instance, a Malibu boat will have needs that are wildly different from a Monte Carlo yacht. Avoiding scams is also important, so do your homework when shopping. When purchasing parts, also check to see if your part has been subject to any recalls. By keeping functional parts in your boat at all times, you can ensure that your boat lasts longer and rides smoother.